An evergreen tree with small fruits in summer, Glochidion ferdinandi earns itself the common name of Cheese Tree. Good dense evergreen foliage make this a good small to medium shade tree. 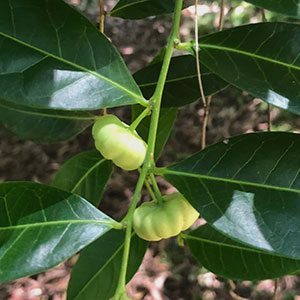 The foliage itself is glossy, the tree does have small flowers however it is the small fruits that look like baby cheese that give the plant its common name. In its natural habitat it grows along creeks and in damp areas, however it will grow well outside of this habitat. This is tree tat will grow well in warmer climates from Queensland to New south Wales as long as it receives adequate moisture. It will also grow well as far south as Melbourne as long as it is in a frost free position. The fruit is not edible, they appear small and green before turning red. Best planted in a oart shaded position in hotter dryer climates and poorer soils. Common Name – Cheese Tree. Position – Will grow from full sun to light shade. Spread – Will form a canopy of around 6 to 8 metres. Flowers – Insignificant, followed by small rounded fruits.